Bondi Beach's rolling white sands and surf culture have made it famous around the world. Located 4.3 miles (4 mi) east of the Sydney central business district, Bondi Beach is the swimming and sunbathing spot of choice for more than just Sydney-siders. It's 0.6 miles stretch offers a paradise for tourists, locals and surfers alike. The village itself is home to a permanent population of 10,000, but this number swells during summer and holidays. 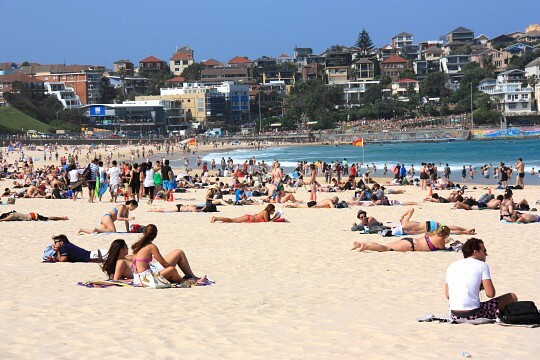 Bondi has become a favorite with European tourists who often spend Christmas at the beach. 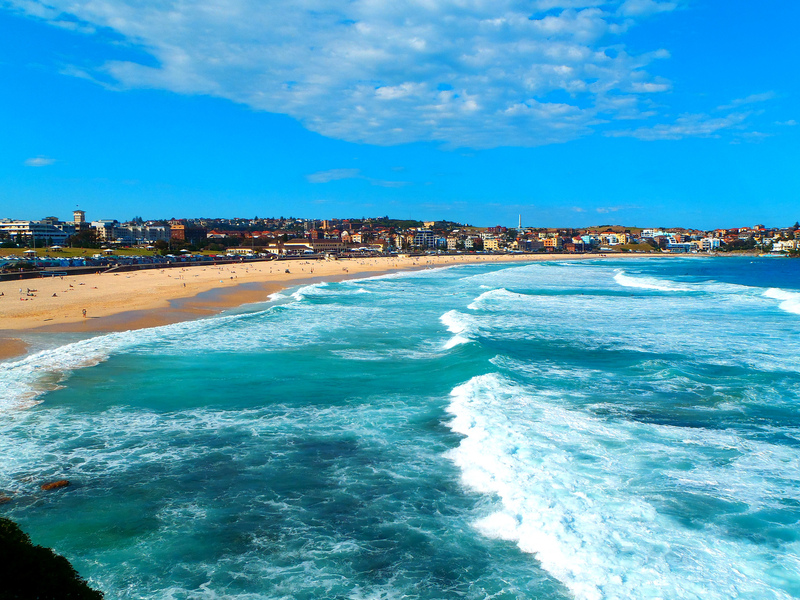 Bondi Beach is the closest ocean beach to the city center, with consistently good waves. The Cadigal Aboriginal people are believed to have roamed the land from the South Head at the harbor entrance to Sydney Cove . "Bondi" or "Boondi" is an Aboriginal word meaning "water breaking over rocks" or "noise of water breaking over rocks". The 6th of February 1938 was a dark day in Bondi's history, and became known as "Black Sunday". A series of large waves struck the beach, pulling swimmers back into the sea. Five people drowned and over 250 people were rescued or resuscitated. For most of the twentieth century, Bondi Beach was a working class suburb, populated largely by migrants from New Zealand, and later by Jewish migrants from Poland, Russia, Hungary, Czechoslovakia and Germany. Jewish immigration has continued into the 21st century, and has left a distinct mark on the culture of the suburb. The northern end of the beach is best for swimming, with its gentle waves and swell. Temperatures average a pleasant 70 °F. Swimming is restricted between the yellow and red flags which are patrolled by lifeguards. In summer months, an underwater shark net is deployed to prevent any unwanted visitors surprising swimmers. 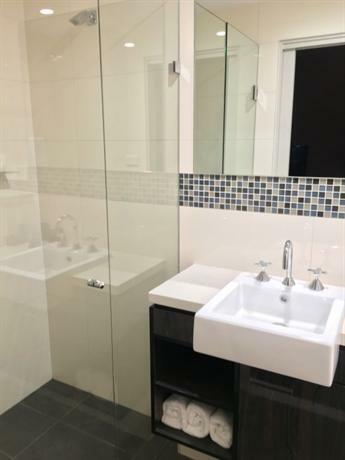 There are change rooms and showers in the historic Bondi Pavilion - access is free. There are also lockers for hire. At the south end of the beach you can find the famous Bondi Icebergs Swimming Club. Full club membership can only be gained by swimming three Sundays out of four from May to September (Australian winter) for 5 years. If you're not up to that commitment, visitors are welcome, or you can check out the restaurant and bar facilities upstairs that overlook the entire beach. Opening hours are Monday to Friday 6am - 6:30pm, and Saturdays and Sundays from 6:30am to 6:30pm. Entry is A$6 ($4.51) for adults, and A$4 ($2.87) for children and seniors. The southern end of the beach is generally reserved for surfers. The sandbar breaks at either end of the beach, however, both offer excellent waves and are good for beginners. At the south end, be wary of the famous rip current known as the "Backpackers' Express", a name given for its proximity to the bus stop and the unwillingness of tourists to walk the length of the beach to safer swimming! 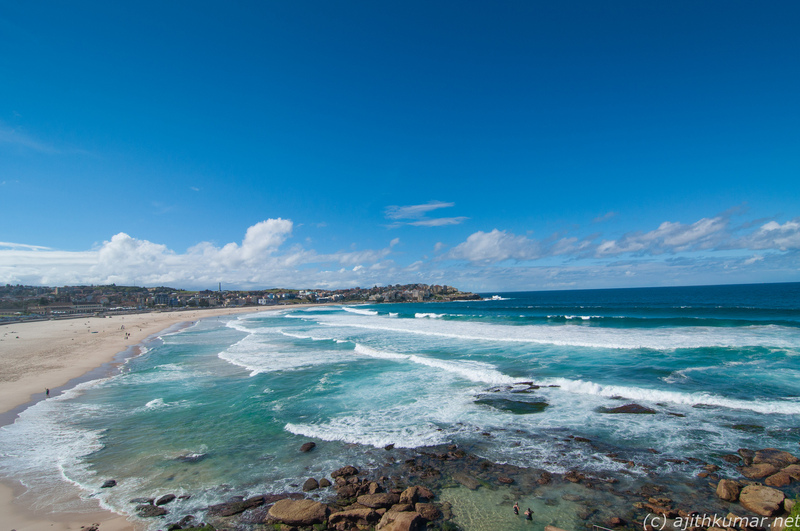 Bondi is home to surf schools like Let's Go Surfing, or you can rent surf boards and body boards, as well as wetsuits. A cheaper option (although further from the beach) is Sydney Surfboard Rental and Hire. You can scuba dive in North Bondi, seeing marine life such as the protected Blue Groper, and visit the Cathedral Cave. 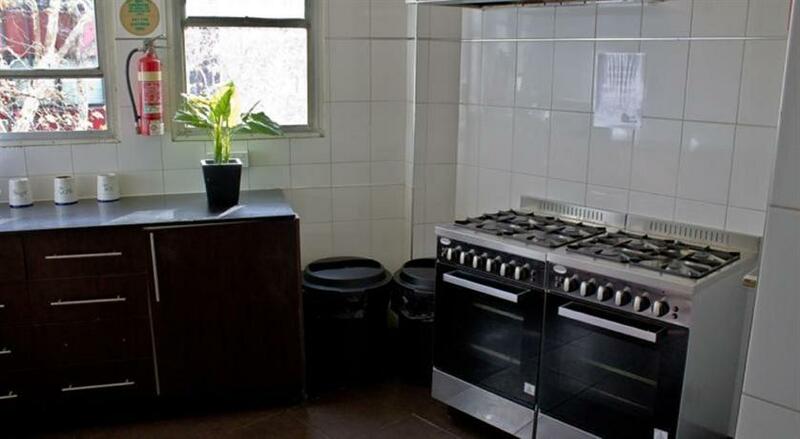 Scuba gear can be rented from Dive Bondi at 198 Bondi Road. PADI dive certification is available: Open Water is A$425 ($349), Advanced Open Water is A$375 ($308). The sport of surf lifesaving was born in Australia, and both the Bondi Surf Bather's Life Saving Club and the North Bondi Surf Life Saving Club claim to be the oldest, being founded in 1907. 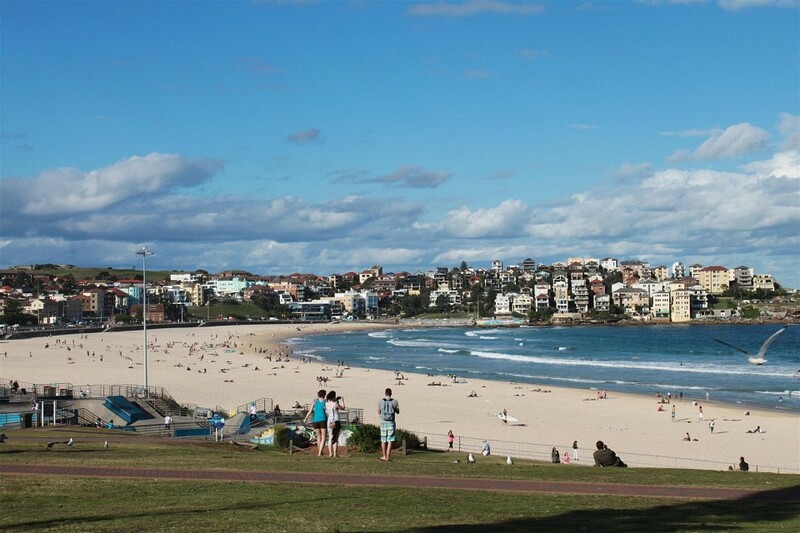 There are two scenic walks from Bondi Beach towards the south. These walks offer great views of the sea, and pass by popular beaches such as Tamarama and Bronte, as well as a number of historic spots. During summer, these walks are packed with tourists, but the view is equally as nice in winter. Bring along lunch, and stop at the picnic areas at either Tamarama or Bronte. This out-and-back route covers 3.1 miles return. It is a medium grade, with some steep steps. The walk begins at the Bondi Pavilion: walk down to the beachside promenade and continue towards south Bondi. You'll pass by Mackenzies Point, which offers superb views south to Maroubra. The sandstone cliffs form part of the Hawkesbury sandstone belt and date from the Triassic Age, 190-225 million years BC. Also keep your eyes open for the Aboriginal rock carvings in Marks Park, which were re-grooved in 1962. The walk finishes at the North Bronte cliffs. This route begins at Bronte Beach and makes its way to Waverley Cemetery, returning via St Thomas Street to Bronte Road. 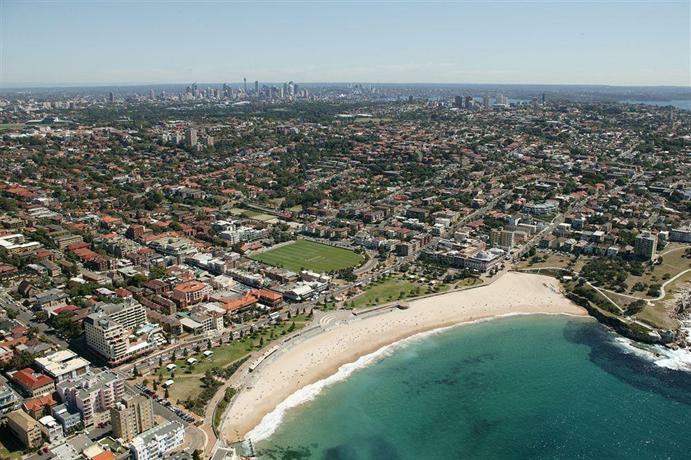 A shorter walk than Bondi Beach to Bronte, it covers 1.7 miles return, and is also of a medium grade. At the north end of Bronte Beach, check out the Bronte Surf Life Saving Club perched on top of the cliffs. The club was the first to use a surf boat for life saving. You'll pass by the Bronte Baths, which were opened in 1887. Regulations at that time stated that ladies were only welcome Mondays through Saturdays, with Sundays and public holidays being reserved exclusively for men. Check out the Bronte "bogey hole" next to the baths, which is a natural swimming hole. It is thought that "bogey" is an aboriginal word meaning "to bathe". Waverley Cemetery was established in 1977, and is the resting place of many famous Australians, including poets Henry Kendall, Henry Lawson and Dorothea Mackellar, as well as aeronautical pioneer Lawrence Hargrave. The cemetery is open 9am to 5pm Monday to Friday, and 9am to 3pm on Saturdays. Guided tours are also available. Bondi Beach is the final destination of the annual fun run known as the City to Surf. Held in August, the race attracts over 63,000 entrants who make their way along the 9 miles course from the central business district to the beach. For swimmers, the North Bondi Surf Classic is a 1.2 miles swimming race held for people of all ages. Flickerfest, one of Australia's top international film festivals is held at the beach each year in January. Other annual events include World Environment Day in June, and Sculpture by the Sea in November. 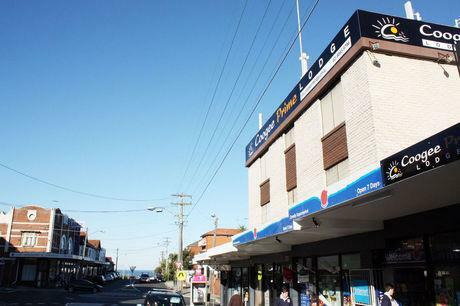 The shopping center of Bondi Beach is found along Campbell Parade and its side streets. The Bondi Beach Markets are held every Sunday from 9am to 3pm in the grounds of Bondi Beach Public School. The Bondi Beach Community Market is open on Saturdays and Sundays from 1pm til late from September to April, and some weekdays during summer. It is located in the heart of Bondi Beach, near Hurricane's restaurant.It has a great range of jewellery, sunglasses and fashion and beach attire. You can find local designers at the market, which is run by a not-for-profit organization, with profits donated to local charities. Near the beach, there is a wide variety of restaurants and cafés, where you can find anything from Asian, vegetarian, cakes to excellent coffee. 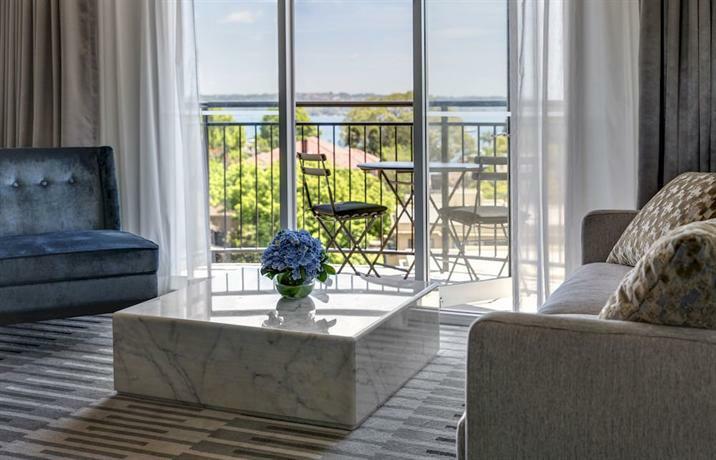 You can find most by walking down Campbell Parade on the beachfront from south Bondi. Many restaurants are BYO - meaning "bring your own" alcohol. This is perfect for bring a bottle of wine of your choice, and then paying a small amount (around A$2 ($1.64)) for corkage. Places worth a try include Monkey Magic on Spring Street for incredible Thai food, the fish and chips at Sports Bar(d) on Campbell Parade, Bondi Trattoria Cafe Restaurant on Campbell Parade, or Pompei's on Roscoe Street. For coffee, hit up Harry's Espresso Bar on Wairoa Avenue, Down Under Coffee, or Gabby's Cafe on Campbell Parade. For the classic fish and chips meal, head to Bondi Surf Seafoods on Campbell Parade. It is home to the dubious local specialty: the deep fried Mars Bar. For a true Australian experience, skip the restaurants altogether and head to the north end of the beach to "throw a few snags on the barbie" - Australian speak for a having barbecue. Don't get caught out though - alcohol is banned on the beach itself. In 2007, the Guinness World Record for the largest swimsuit photo shoot was set at Bondi Beach, with 1,010 bikini-clad women taking part. Bondi Beach has featured heavily in Australian and international film and television, from local series such as "Bondi Rescue", a series about the lifeguards who patrol the beach, to featuring in the Scooby Doo movie "The Legend of the Vampire". 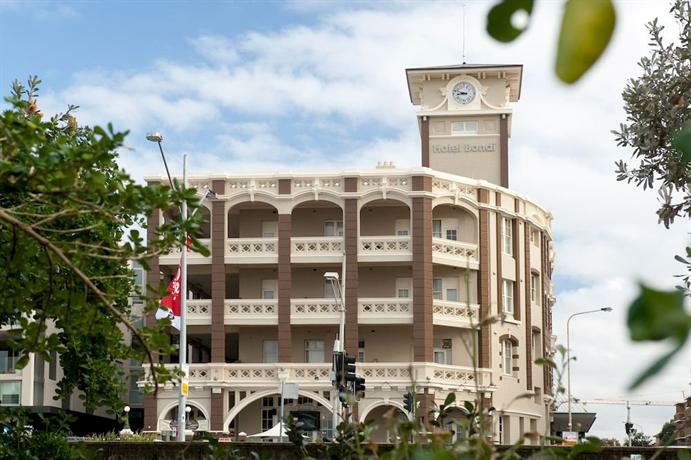 Bondi is a suburb of Sydney, the capital of the state of New South Wales. Arriving by car is not advised, due to the poor parking available. Many streets are designated as residents' parking only, limiting visitors to 2 hours. The bus you want to catch is the 380. Buses run to the beach at 10 minute intervals, and all day to Bondi Junction (3km from the beach). Services are less frequent after 7:30pm, with buses then running every 15 minutes until midnight. After 12am, buses run half-hourly. On Friday and Saturday nights buses run half hourly all night. One of the fastest ways to see Bondi Beach in a short period of time is via the Fantasea ferry. It operates a twice daily cruise to Bondi Beach from Circular Quay and Darling Harbour. Departures are daily at 10:30am and 2pm from Pier 26 Darling Harbour, and 11am and 2:30pm from Circular Quay Eastern Pontoon. Entry is A$65 ($53) for adults, A$45 ($37) for students and seniors, and A$35 ($29) for children (ages 5-15).